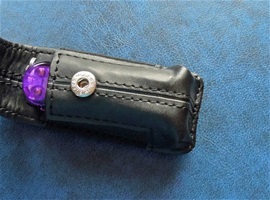 Here is a little gem of a small Wenger Leather Pouch and it is the Case 21. This one fit very well the nail-clip editions or smaller 65mm configuration as well. It is always nice when the quality is so nicely made like this. I have done some pictures for you that follow sakhome.com. 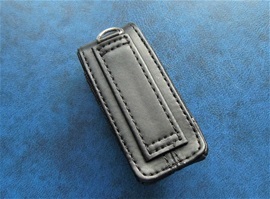 This is a quality made leather pouch. 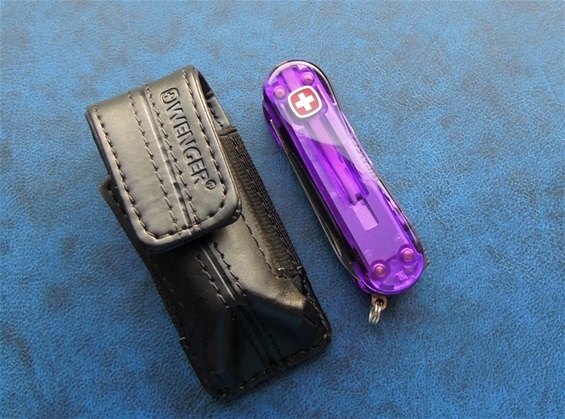 It is a combination of leather and soft fabric so the plastic handle scales does not get scratched up and the push button is hidden. I would also like to show you a vintage KJ Mora large tollekniv. 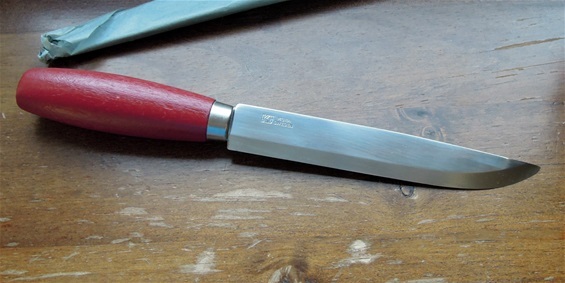 The blade is actually 16cm long and it got the classic design and red wood handle. KJ Mora should be KJ Eriksson and these also came without a sheath. I do wonder if it is original cellophane paper. It is a paper type and it is looks to be original. The surface on the blade is polished well so it is free from spots and corrosion. It should be carbon steel. Usually when it was stainless it was marked somehow. The blade is a bit over 2mm thick and the secret to why these knives were rather strong in the construction is the ferrule. Some of these Classic type knives are still made by Mora. The tang is designed in a way that it fit the ferrule and the combination of them makes the design rather strong. The ferrule is fit 65% under the ferrule as well. I remember these as a kid and they require maintenance, if so they last a long time. Very inexpensive knives with good steel. Let me know if you have input or information. as a kid these knives looked like small sword. The truth is that these are very functional for many tasks. They bite into wood and the extra length some like. With knives in general if it is stainless or carbon steel it is polished surface that gives the extra corrosion resistance. It all depends on the products and designation. On Swiss Army Knives the stainless steel is made of a good selection of stainless steel and the surface is very well polished. On SAKs this is important. On fixed blade knives it is much easier to do maintenance. Even so the surface got something to say. A mirror polished surface on stainless steel gives extra resistance to namely corrosion. This you can see on fixed blade knives that people have stored and that carbon steel blades especially with well-polished surface are without patina and spots. Carbon steel responds to substances in the material you use them on and these can be difficult to remove. This got nothing to do with any negative influence on the quality. I did not do anything to the surface on this KJ Mora knife from Sweden. It should be a time window of a knife. I am very glad I got this! These came with sheath and without sheaths. I am not sure about the exact age yet. Let me know! Not my best drawing but it does show what the tang usually look like. It is a stick tang that is peened in the back. It was used different methods of peening on them. Sometimes the wood is fit more than 65% under the ferrule. It depends, sometimes less too. By having an angle like the tang construction you get a strong construction that can take force. The ferrule is made from steel and it is called bolster sometimes too. The wood used on these knives is usually not the best and therefor the bolster strengthens the construction. The bolster allows flexibility in the construction without breaking the wood handle. This to some degree of course. The tollekniv got a barrel shape that allows this design to be an all-use type handle. It is for the biggest hands without any problem. A ferrule or bolster is interesting because it allows force without collapsing the tang. The blade rests against the ferrule on top and bottom as a support. Metal over wood is a very smart invention, I have a few times before restored older used blades and removed the peening at the back and then used two-component epoxy inside the handle and bolster. This becomes very strong and much better against corrosion. These Mora knives do not have the best precision with the wood vs the tang. They are a bit crude and therefore the bolster is the reason for why they are rather strong. If you glue them then they become stronger and they will not allow water or moist with dirt to get inside the handle. Even if there is a good fit between the blade and bolster it will not prevent water coming in. This usually results in corrosion. If you use glue you will also prevent the wood drying out. Mora use strong metal bolsters that can be reused with glue or if you make a new handle. The bolster also rests against the rim of the wood. During force and flexibility you will get some forces working along the total rim around it. If you use glue the stability of the cutting performance will be improved. Modern two-component epoxy totally filled under everything will make such inexpensive blades much better. Some of the peening types used on the back of the blade make it difficult to remove or open the handle. It can be a fun project if you like such knives. It is also possible to make a new handle and then it is easy to remove the peening when you are not using that handle again. When I made a new handle I fit the wood 100% under the ferrule and that can be interesting and fun to do. It will become a sturdy blade. This KJ Mora knife i will not do anything with, it will be like it is. The edge used is a typical Scandinavian one that is flat with no secondary edge. It can interesting and fun to use Swiss Army Knives when you make a new handle. Then it is best to use the 85mm Wenger knives for carving. This Mora knife i will make a sheath for at a later date. It is fun to have some projects in wait. I wanted to mention some about this knife because i remembered them as a kid and it is always a bit fun sometimes to sprite things up a bit with variations. 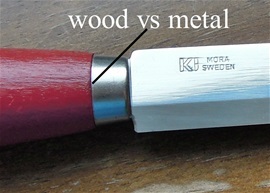 Last today i can mention about the tang of the Mora knife that when you glue to remember to clean the metal. Usually the surface is coarse after an inch from the blade. There are also variations on the cut notch when you are close the end of the tang before the even smaller place for peening. This notch is very useful when you glue the handle and the same goes for the coarse surface. You can also make small notches for the glue if they are not present. Usually these can be glued right away when stripped, just clean the metal with warm water and soap. Then use a metal brush or sand paper.